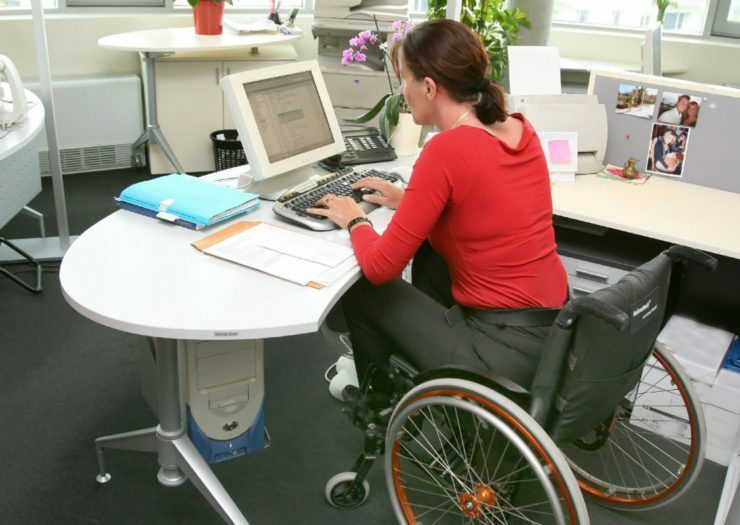 For far too long, people with disabilities have been excluded from the workforce. In addition to benefits that will keep us out of poverty if we cannot do so, we deserve the opportunity to work for a living wage. Throughout his campaign, President-elect Donald Trump largely ignored the diverse disability community, which represents nearly one in five people in the United States. Still, I remained optimistic after the election that he would at least nominate people with some disability policy experience to his cabinet. Now that most nominations are complete, however, it is clear that Trump’s cabinet will consist of individuals who are mostly inexperienced, very wealthy white men with histories of racist, Islamophobic, and anti-LGBTQ views. To the best of my knowledge, only one selected cabinet member identifies as having a disability: Gary Cohn, who will serve as director of the National Economic Council, has dyslexia. In addition to lacking disability representation, the cabinet selections offer little in terms of disability policy experience—so although many of their specific plans are still unknown, Trump’s picks are troubling when it comes to the rights of those with disabilities to live full lives. In 1975, Congress passed the first special education law guaranteeing students with disabilities the right to free and appropriate public education. Passage of what is now called the Individuals with Disabilities Education Act (IDEA) ensured that students with disabilities receive education based on individual needs in the least restrictive environment. Special education is far from a perfect system and could certainly be improved. As a child, this meant I had an Individualized Education Plan, which specified the supports and services I needed to achieve my educational goals. Those supports, such as note-takers and extra time on tests, allowed me to excel throughout elementary, middle, and high school. Ultimately, because I received a free and appropriate public education as a child, I was able to successfully complete college and law school. I am now finishing up my PhD. Unfortunately, Trump’s selection to the Department of Education, Betsy DeVos, has no governmental experience with public schools. Rather, she is a staunch supporter of “school choice,” which ostensibly allows families to choose which type of school (in other words, public or private) their child attends and for federal funding to support private schools. This is something public school advocates fear. They argue that redirecting dollars from public to private schools weakens public education and gives taxpayer support to schools that don’t have the same obligation to serve all students, including those with disabilities. Special education is already extremely underfunded: Although IDEA calls for 40 percent of special education be funded by the federal government, that has never happened. In 2016, for example, the federal government covered only 16 percent of special education costs. Hence, cutting more public school funding would make a bad situation even worse. DeVos is not the only potential cabinet member whose record could be dangerous for students with disabilities. Trump’s pick for attorney general, Jeff Sessions, has a long history of disparaging special education. Indeed, as U.S. attorney for the Southern District of Alabama, Alabama’s attorney general, and a member of U.S. Congress, Sessions has trashed the IDEA, describing it as “hurting public education” and “the single most irritating problem for teachers throughout America today.” Moreover, Sessions has promoted the segregation of students with disabilities, stating in 2001 that many should be “put in an alternative setting where the disability could be dealt with.” This line of thinking runs completely counter to the IDEA’s mandate that students be educated in the least restrictive environment, along with their peers. During the Obama administration, the Departments of Education and Justice worked together on key issues facing students with disabilities, including reforms to school discipline, pursuing desegregation in schools, and efforts to eliminate the school-to-prison pipeline. What happens under DeVos and Sessions, either separately or in collaboration, remains uncertain but hugely disconcerting. Students with disabilities and other marginalized students may very well be put at great risk, and that should worry us all. So should Trump’s selection for Department of Labor secretary. Given the Department of Labor’s important role as the chief federal agency responsible for developing policies and programs that expand U.S. employment opportunities and rights, it is alarming that Trump has nominated Andrew Puzder, an individual with no governmental experience and someone who has criticized increasing rights for employees. Notably, the Department of Labor enforces the Fair Labor Standards Act, as well as providing guidance to employers and employees on applicable laws, such as the ADA. I am particularly startled by Puzder’s history of being accused of discriminating against people with disabilities. For example, in 2005, Puzder’s company, CKE Restaurants, Inc., was made to pay $34,000 to settle a discrimination suit brought by the Equal Employment Opportunity Commission (EEOC) on behalf of a woman who had Treacher-Collin syndrome, a condition that results in facial abnormalities. The EEOC asserted that Hardee’s violated the ADA by failing to hire the woman due to her disability. After people with disabilities graduate, we often contend with employers who illegally refuse to hire us based on incorrect assumptions or who hire us and then deny our requests for accommodations. We also receive government benefits that disincentivize working. For example, in many states, people with disabilities are no longer eligible for Medicaid if they work. Given the many barriers to employment for people with disabilities, it is not surprising the employment rate of people with disabilities is strikingly low. People with disabilities need someone in our court who respects our legal right to work, not someone who discriminates against us. In addition, Puzder is an outspoken critic of raising the federal minimum wage. Not only are people with disabilities often unemployed, they are also frequently underpaid when employed. In fact, it is legal for some organizations to pay people with disabilities less than minimum wage. Advocates have worked hard to get rid of subminimum wage, and the Obama administration has made some strides in that regard at the federal level. However, the work is far from done and we need a government that believes everyone should be paid a reasonable wage. For far too long, people with disabilities have been excluded from the workforce. In addition to benefits that will keep us out of poverty if we cannot do so, we deserve the opportunity to work for a living wage. We need a leader at the Department of Labor committed to developing policies and programs that promote employment for us. Puzder is not that person. In addition to school and a source of income, we all need a roof over our head. Finding a home or apartment that is both affordable and accessible can be can be challenging for people with disabilities, who are overwhelmingly living below the poverty level, with many receiving public benefits. The poverty we experience can make paying for an apartment insurmountable. In fact, the national average rent for a one-bedroom apartment equals 104 percent of a monthly supplemental security income benefit. The Department of Housing and Urban Development (HUD) is tasked with overseeing federal housing programs. HUD plays a critical role in ensuring low-income people with disabilities have access to affordable housing. In 2015, more than half of all individuals who lived in federally subsidized housing were elderly or disabled. Yet Trump has selected Ben Carson, another nominee with no housing experience or any prior governmental experience at all, to lead this vital agency. HUD is also responsible for enforcing fair housing laws, which prohibit discrimination against people when renting or buying a home. Far too often, people with disabilities encounter discrimination when seeking housing. In fact, complaints by people with disabilities make up the majority of discrimination complaints received by HUD. While Carson says he believes everyone should be protected against discrimination, he thinks we should all “move on to something more important.” He also has stated racism is “a thing largely of yesterday.” How can someone so out of touch with the reality of discrimination effectively lead a federal agency responsible for protecting against it? Clearly, the federal government plays an important role in ensuring that people with disabilities have the right to earn, learn, and live in our communities. This is something I am grateful for. However, with a president and cabinet who have shown little regard for my community, the future is bleak.